SUMMIT, NJ – A team of fifteen volunteers from the Rotary Club of Summit – New Providence visited SAGE Eldercare this week as part of the Rotary’s new monthly program “Rotary for Community.” Volunteers spent time visiting with clients of the Spend-A-Day Adult Health Care program and helped deliver Meals on Wheels. The Rotary, whose motto “Service Above Self,” has been involved with community projects in Summit and New Providence since 1922. Along with community service, the Rotary has been awarding financial scholarships to college bound seniors for 92 years. Six were awarded this year. 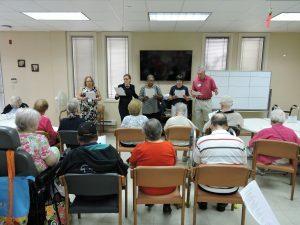 SAGE was the first stop on the list of organizations they are scheduled to help because of SAGE’s 64 year history of serving older adults in the area. “SAGE has been an integral part of the community and in the fabric of Summit for so long it was easy to team with SAGE for our first project,” said Rotary President Swati Goorha. To learn more about the Rotary of Summit – New Providence visit their website: http://snprotary.org/index.php.